Home / Vacancy / Vacancy Announcement from Reliable Nepal Life Insurance Limited. Vacancy Announcement from Reliable Nepal Life Insurance Limited. 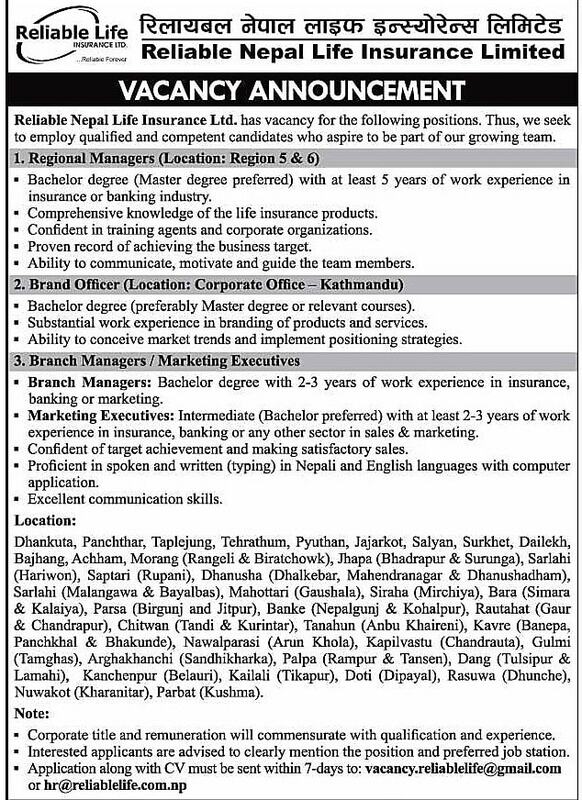 Reliable Nepal Life Insurance Ltd. has the vacancy for the following positions. Thus, we seek to employ qualified and competent candidates who aspire to be part of our growing team. Bachelor degree (Master degree preferred) with at least 5 years of work experience in the insurance or banking industry. Comprehensive knowledge of the life insurance products. Confident in training agents and corporate organizations. Proven record of achieving the business target. Ability to communicate, motivate and guide the team members. Bachelor degree (preferably a Master degree or relevant courses). Substantial work experience in the branding of products and services. Ability to conceive market trends and implement positioning strategies. Branch Managers: Bachelor degree with 2-3 years of work experience in insurance, banking or marketing. Marketing Executives: Intermediate (Bachelor preferred) with at least 2-3 years of work experience in insurance, banking or any other sector in sales & marketing. Confident of target achievement and making satisfactory sales. Dhankuta, Panchthar, Taplejung, Tehrathum, Pyuthan, Jajarkot, Salyan, Surkhet, Dailekh, Bajhang, Achham, Morang (Rangeli & Biratchowk), Jhapa (Bhadrapur & Surunga), Sarlahi (Hariwon), Saptari (Rupani), Dhanusha (Dhalkebar, Mahendranagar & Dhanushadham), Sarlahi (Malangawa & Bayalbas), Mahottari (Gaushala), Siraha (Mirchiya), Bara (Simara Kalaiya), Parsa (Birgunj and Jitpur), Banke (Nepalgunj & Kohalpur), Rautahat (Gaur Chandrapur), Chitwan (Tandi & Kurintar), Tanahun (Anbu Khaireni), Kavre (Banepa, Panchkhal & Bhakunde), Nawalparasi (Arun Khola), Kapilvastu (Chandrauta), Gulmi (Tamghas), Arghakhanchi (Sandhikharka), Palpa (Rampur & Tansen), Dang (1111sipur & Lamahi), Kanchenpur (Belauri), Kailali (Tikapur), Doti (Dipayal), Rasuwa (Dhunche), Nuwakot (Kharanitar), Parbat (Kushma). Corporate title and remuneration will commensurate with qualification and experience. Interested applicants are advised to clearly mention the position and preferred job station.